Google has become so big that sometimes it's difficult to understand just how big it is. It's on course to do $60 billion in revenue this year, almost all of that from advertising. But how big is that in terms of the media it competes against for ad dollars? To answer that, Business Insider CEO Henry Blodget presented this slide in his keynote at Ignition 2013 this morning. 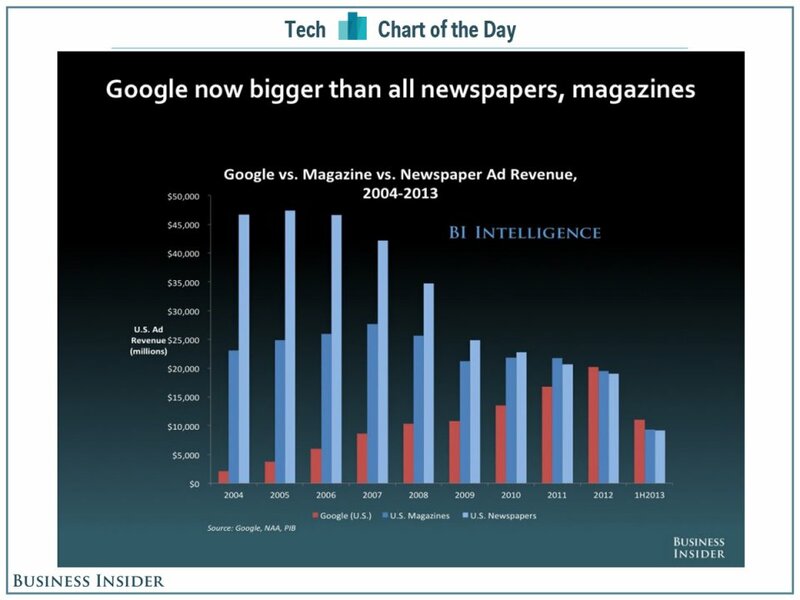 It shows that Google alone is now bigger than either newspapers and magazines. In part this is because the print media has suffered such a precipitous decline. But note that Google's last full year results from 2012 are approaching the historic maximum that all magazines combined achieved back in 2007 before the crash. It's won't be long now, in other words, before Google not only eclipses magazines but also becomes bigger than magazines ever were — even when there was no Internet to compete with. As Schools Become More Technologically Advanced, Who Is In Charge?